The InLinkz button, for every edition of PAF, is open from Thursday evening at 7:00 p.m. EDT to Saturday evening at 7:00 p.m. EDT. To read the guidelines for participation you have just to click on the Photo Art Friday tab under my header. As always you are encouraged to link up any image YOU consider to qualify as a piece of photo-ART. If you choose, you can use the weekly optional prompt. This week's prompt is, The Beauty of Aging. This flower's form is shrivelling, losing its allotted amount of life energy ... and still it proudly displays its beauty. I experimented - adding this burgundy painterly texture (from my private collection) to the photograph of the aging flower. 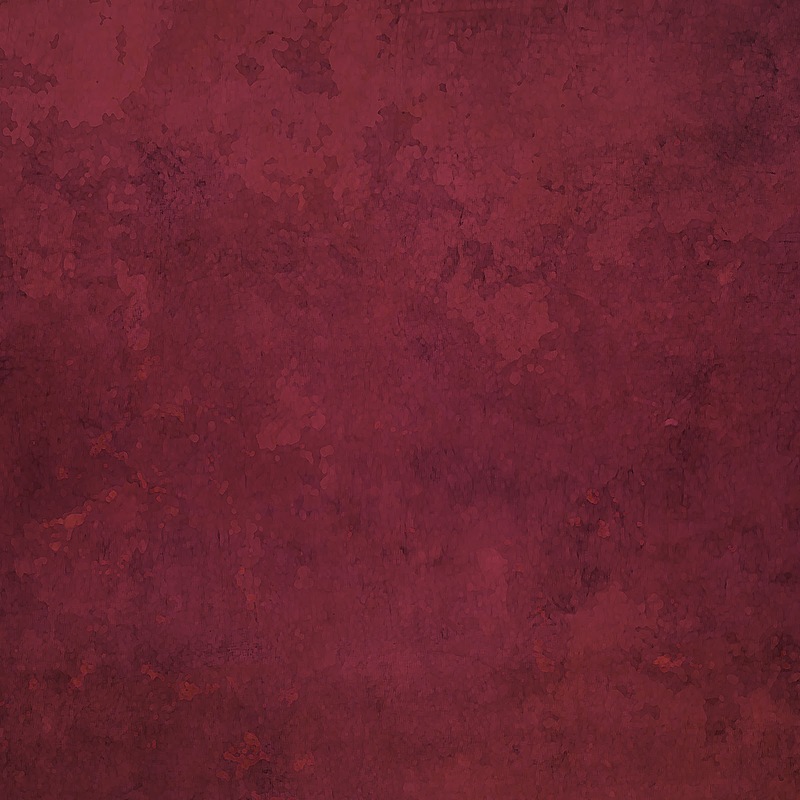 The texture was blended into the photograph using Hard Light blend mode. I experimented with bringing in more light (using a Levels adjustment) but found I liked the dark and sultry tones just as they were. The texture imparts a painterly feel to the image and I am happy not making any further manipulations. Aged, dramatic and beautiful (to my eye). you can use the optional prompt, abstraction(s) from nature. * develop our familiarity and expertise with the use of our editing tools. Remember, we are all at different stages of learning and experience in our digital art journey, so try not to compare yourself to others who have had more time to develop their skills. We are where we are and should be proud of our desire to create, and the progress we have made at this point in time. Comparing ourselves to someone who has been a photographer or digital artist for many more years than our self can only serve as a discouragement. Surely we come here to support and encourage our artistic impulses, so do try to enjoy where you are in your artistic development and what you are accomplishing right now! When you view the photo art of those with more experience under their belt, just use it as an indication of what you can eventually do too, as you continue your journey. I would love to know what you would see, and what you would realize if you looked over all the submissions you have made to PAF - in the order in which you submitted them. What would/do you notice about your artistic evolution? The answers will certainly be as varied and numerous as the number of participants! Wow! Your edit does add a lot of drama and glamour to the original image! Your example is magnificent - and so very, very dramatic! Oh Bonnie, you'll have to read what I've written on my post, before I came over here and read your words. About different skill levels! I think your words and your art are lovely this week. Thanks for the inspiration each week, I'm learning so much from you! 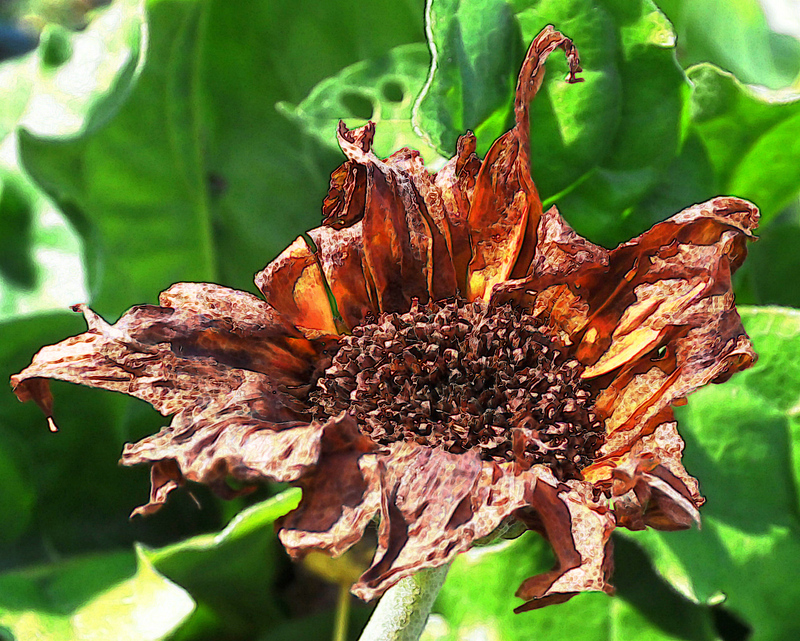 You certainly did beautify this ageing flower. And such a majestic colour to suit. First I really like your original. It truly is beautiful even in it's decaying state. Second the edited version...be still my heart. Wow that is such a change but I love it. Lastly thank you so much for what you said about not comparing ourselves to others with more experience in photo editing and photography. I tend to do that and it really made me feel good to know that I can be happy where I'm at and learn from others without feeling inferior to them. 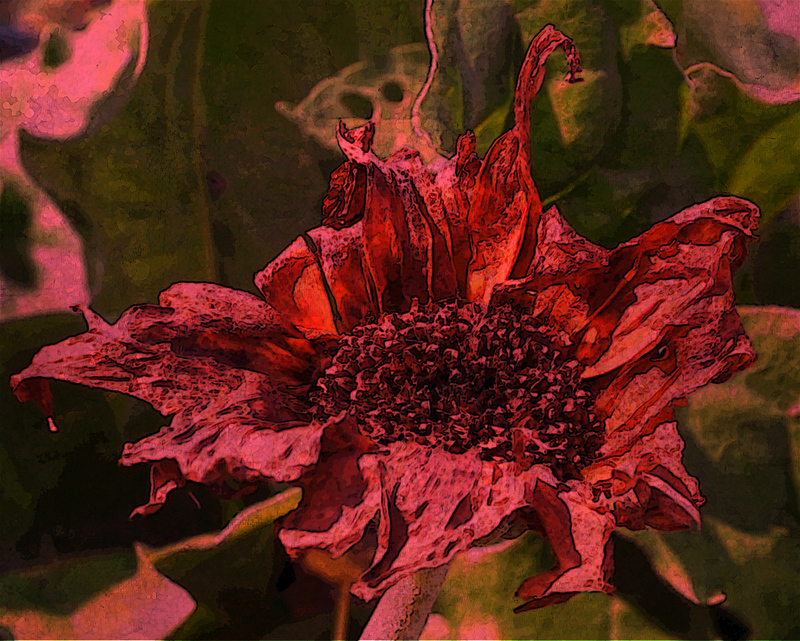 Delicious with a nice picture fading flower, very dramatic, love, beautiful texture and processed, with exquisite tones. p.s. 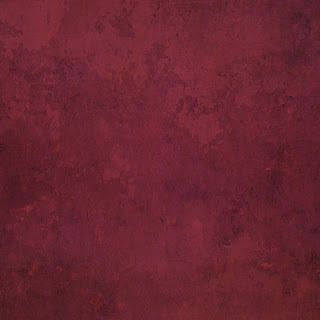 thank you for the give-away textured background - found a way to use it so am now looking at your shop! I am in awe of this, Bonnie. As is often the case, visiting others' responses to the prompt, or NOT, I see BEyond my limitations and deep into the heart of the possibilities. I love this BEfore and After. Both for different reasons yet both for very much the same reason: their resonance. That is what I am taking away this week, the ways to interpret and the ways to push off from a prompt. Nothing "more" or "less" nor "good" or "bad." Everything for its magic and inspiration. Glad things are looking up and moving along for you, too. Life's little speed bumps are often the times where I go inside most deeply and come out refreshed, and always different. Bonnie, I love your images. Although I prefer the processed one (love the reds) the original is stunning as well! A beautiful picture of an old beauty. This is such a dramatic image. I'm impressed with how you've delineated the flower so that it stands out so beautifully. Gorgeous..deeply poetic and meditative..both pieces are stunning and magical in their own way! I really like the raw version of this shot! natural beauty in aging. And you're right, we shouldn't compare ourselves to somebody else. In your weekly link-up there is so many different artists and so many different interpretations of the theme I find it amusing and ONLY encouraging! WOW, Bonnie .. this is just a superb picture - completely amazing, Thanks for sharing!!! Wonderful processing with that beautiful, deep color, and I also like teh original shot! I am thrilled to have discovered this website. I really appreciate your sensitivity for those of us that are not experienced. (Me) but I have enthusiasm and am inspired by so many. I did attempt to post at my blog for the theme prompt but was too late. I look forward to next time. I took a few minutes to browse back through my PAF entries and was surprised to see that I started out doing mostly abstract pieces (your wonderful abstracts are what attracted me to PAF in the first place) and I seem to have got away from that. Not that there's anything wrong with that but ... note to self: do more abstracts! Please don't apologize Karen. I'm glad you posted here and hope Tito Eric will read it. I could not comment on his image either because of 'malware' warnings that come up and my computer closes his site. Tito Eric, I too, love to see your images and the worthy thoughts that accompany them. I had some internet connection problems Sat. and Sun. - will get to the posts I have not visited yet soon!! !